Too Busy for Breakfast: Muffins & Granola Recipes! Deciding what breakfast foods taste best, are healthy, and cooperate with your (presumably) busy morning schedule can be daunting. The ‘easy fix’ can be tempting – grabbing a muffin on the go, a sugar packed treat, or skipping breakfast altogether are more than common these days. With drive thru’s on every corner, easy access to breakfast is there…but definitely not the way to go to reach your fitness/nutritional goals. Muffins are one of the most misleading breakfast selections out there – packed with calories, fat and sugar. The ‘Whole Grain Orange Carrot’ muffin from Tim Horton’s sounds like a healthy choice, right? The words ‘whole grain,’ give off a nutritionally persuasive appeal, but the reality is that you are better off grabbing one from McDonalds! The Tim Horton’s muffin will set you back 370 calories, 13 grams of fat, and over 30 grams of sugar! Meanwhile, not much better but still coming out on top is the McDonalds Fruit and Fibre muffin, at just as many calories, but less sugar and carbs than the other! This still presents a dilemma – for people on the go, who like quick and filling breakfast muffins, what can you have as an alternative? We have a delicious recipe packed with flavour (and nutrients!). Low in fat, half the calories of food chain muffins, and with the protein and sugar sweetness you desire… you will love this! 1. Preheat oven to 375 degrees F (190 degrees C). Lightly oil 18 muffin cups, or coat with nonstick cooking spray. 2. In a medium bowl, whisk together eggs, egg whites, apple butter, oil and vanilla. 3. In a large bowl, stir together flours, sugar, cinnamon, baking powder, baking soda and salt. Stir in carrots, apples and raisins. Stir in apple butter mixture until just moistened. Spoon the batter into the prepared muffin cups, filling them about 3/4 full. 4. In a small bowl, combine walnuts and wheat germ; sprinkle over the muffin tops. Need a little extra ‘oomph’ in your morning breakfast? 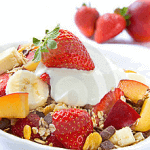 A great addition to yogurt, or pre/post workout snacking extra, is granola! With healthy fats, protein and carbs, this nutrient packed granola recipe will give your body a surge of sustained fuel! 2. In a large bowl, mix together the oats, wheat germ, flax seed meal, brown sugar, sunflower seeds, pecans, almonds, cinnamon and salt. In a separate bowl, whisk together the oil, honey, vanilla and water. Pour the wet ingredients over the dry, and mix until evenly blended. Spread in a greased 9×13 or 11×7 inch baking pan. 3. Bake for 1 hour in the preheated oven, stirring every 20 minutes, or until toasted. Let cool completely before storing in an airtight container. Have any recipes you love? Send them to us at info@kalevfitness.com !